Invisalign has quickly become the preferred orthodontic treatment option for teens and adults due to the various advantages when compared to traditional metal braces. Invisalign offers a discreet treatment that’s nearly invisible due to the use of clear aligner trays. In addition to a less noticeable treatment, the length of time treatment takes is often significantly shorter than that of traditional braces. All-in-all, Invisalign offers a more convenient and comfortable treatment that doesn’t compromise the quality of the final results. At Vanderbrook and Hoppe Dentistry, we offer Invisalign in Dallas to give you a stunning new smile in half of the time. Invisalign is among the newest and most preferred orthodontic treatments because it resolves many of the common complaints associated with traditional braces. The treatment involves using a series of clear aligner trays that are custom-made using 3D scans of your teeth. Each tray in the series will gradually move your teeth into their proper alignment without the tugging or pulling of wires. Each tray in the series is worn for about two weeks, which you are able to switch to the next tray right from your own home, so you’ll require less trips to the dentist because adjustments aren’t needed. The removable trays are worn for 20 to 22 hours per day. Oral hygiene is easier since the trays are removable because you don’t have to brush around wires or brackets. Simply brush and floss as you normally do. You’ll also enjoy less food restrictions and added comfort since wires and brackets aren’t used. Treatment using Invisalign varies depending on your exact treatment plan and the severity of your misalignment. The average length of treatment for adults is about 12 months, however, the length of time can be shorter or longer depending on your progress and treatment plan. At the end of your treatment, you will need to use a retainer to prevent the teeth from moving back into their previous position. For those who have healthy gums and teeth, Invisalign may be right for you. Invisalign is effective for treating minor bite problems, such as small gaps, minor overcrowding or slightly crooked teeth. 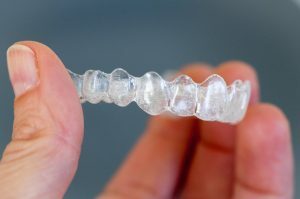 Those who have significant alignment and bite issues may not be candidates for Invisalign. To determine if Invisalign is right for you, you’ll need a consultation from your dentist. Vanderbrook and Hoppe Dentistry is your dentist for Invisalign in Dallas. We provide the discreet orthodontic treatment to give you a straighter smile in less time than traditional braces. After performing a thorough consultation to determine if Invisalign is right for you, we’ll create a customized treatment plan to give you a stunning new smile. Using 3D computer imaging, we’ll design your treatment plan to reposition your teeth. We’ll give you a preview prior to starting treatment so you can see what your new smile will look like at the end of treatment. If you’re ready for a straighter smile with Invisalign, contact our office at (214) 821-5200. Comments Off on How Long Does Invisalign Take to Complete?